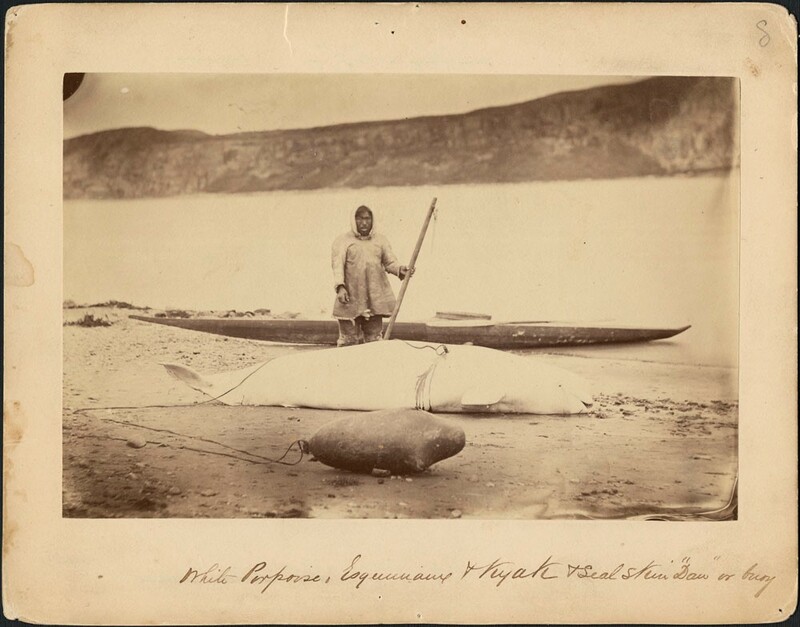 Since its beginnings in 2002 as an Inuit-focused project, Project Naming has expanded to engage all Indigenous peoples to identify photographs in Library and Archives Canada’s (LAC) collection. The majority of individuals in the images of the collection have never been identified; they are anonymous. Additionally, archival descriptions relating to events or activities are absent or have outdated information (e.g., place names, band names or terminology). The information is based on original inscriptions and captions found on the records, and hence it reflects the biases and attitudes of non-Indigenous society at the time. 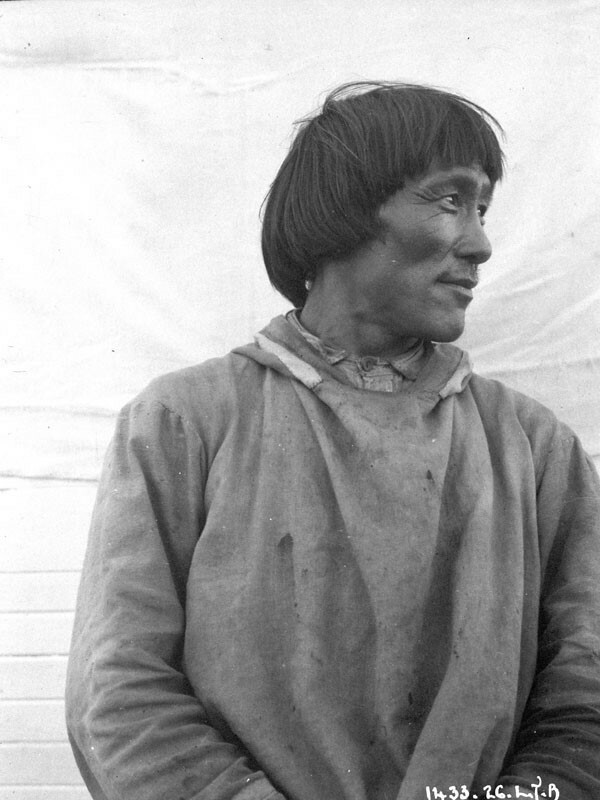 Since 2002, approximately 10,000 images have been digitized, and approximately 2,500 mainly Inuit individuals, activities and places have been identified. In honour of the project’s 15-year anniversary, a celebratory event took place over the course of three days in March 2017. It was held at LAC and Carleton University in Ottawa and involved Inuit, First Nations and Métis peoples as well as the general public. Project Naming’s 15th anniversary event was not only a celebration of all the individuals who have been identified and of partnerships with Inuit communities, but also a celebration of Indigenous cultures as well as a chance to look back at the past to build a better future. Throughout the three days, Inuit, First Nations and Métis Elders shared their knowledge and made important recommendations on the future direction of Project Naming, and on the future of a country where Indigenous peoples are no longer unidentified, silenced and forgotten. Clément Chartier, President of the Métis National Council, at LAC for the 15th anniversary event of Project Naming, March 3, 2017. Although Project Naming has taken some important strides in undoing past wrongs, much more work still needs to be done. To mark the 15th anniversary, new official Facebook and Twitter pages for Project Naming have been launched. This greater presence on social media provides a new platform for non-Indigenous Canadians and Indigenous peoples to recount their stories, share their histories and continue the significant work that Project Naming has begun. Manitok Thompson (left) and Kathleen Ivaluarjuk Merrit (right) identifying photographs at the Carleton University Art Gallery in Ottawa, March 2, 2017. 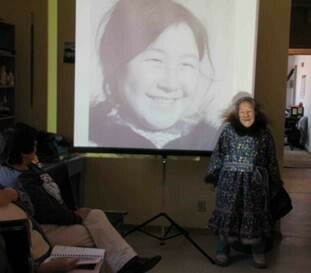 “When you see those pictures, it’s like coming home,” Inuit Elder Piita Irniq declared during the event. His statement indicates just how much power a photograph can have. Project Naming is therefore not simply about identifying people, places and things; it is about regaining what has been lost, finding oneself and being able to return home. Sessions at the event became about more than just identifying names. 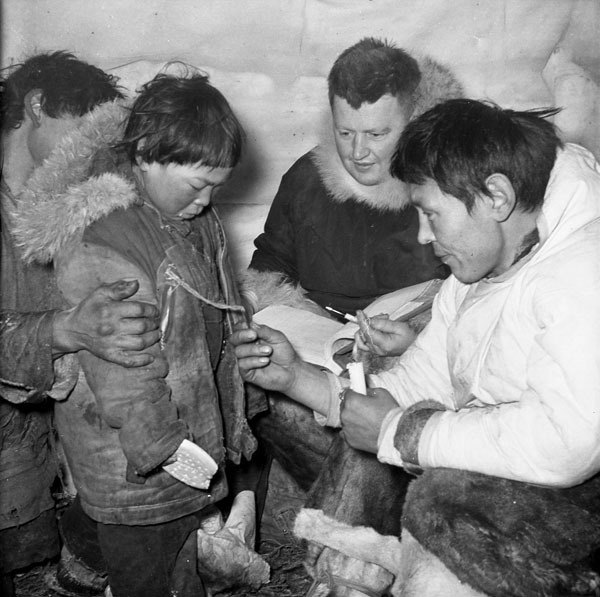 These sessions were about sharing knowledge, whether about clothing, physical traits, hunting, fishing, trapping, families or traditional ways of life. Most importantly, every photograph in every session was a means of sharing a story or personal memory. Elder Piita Irniq (right) and Nunavut Sivuniksavut students Gabe Klengenberg (left) and Aislyn Gizelle (centre) during a session at LAC for the 15th anniversary event of Project Naming, March 1, 2017. I cannot speak for others, but I had the sense that those who attended the event left with more awareness than when they arrived. It was truly three days of education, an education that every Canadian would benefit from, and one that Project Naming is intended to foster. Every time a face was identified during the event, it felt like a victory, like a difference was being made and an identity restored. Having the chance to watch the Elders identify people and places was remarkable. What was even more incredible was the energy in the air, the feeling of collaboration, respect and reconciliation. Project Naming will continue the meaningful work it has done over the past 15 years; with new partnerships with Inuit, First Nations and Métis peoples, a positive difference will continue to be made. To all those who may not know about Project Naming and how to help, visit the web page and social media accounts, “like” the page, share the photos and help make a better Canada, one where people’s identity will not be erased but will instead be celebrated and honoured. Curtis Kuumuaq Konek at LAC during the 15th anniversary event of Project Naming. Julie Dobbin is doing her MA in Indigenous and Canadian Studies at Carleton University. She wrote this article during a practicum in the Exhibition and Online Content Division at Library and Archives Canada. 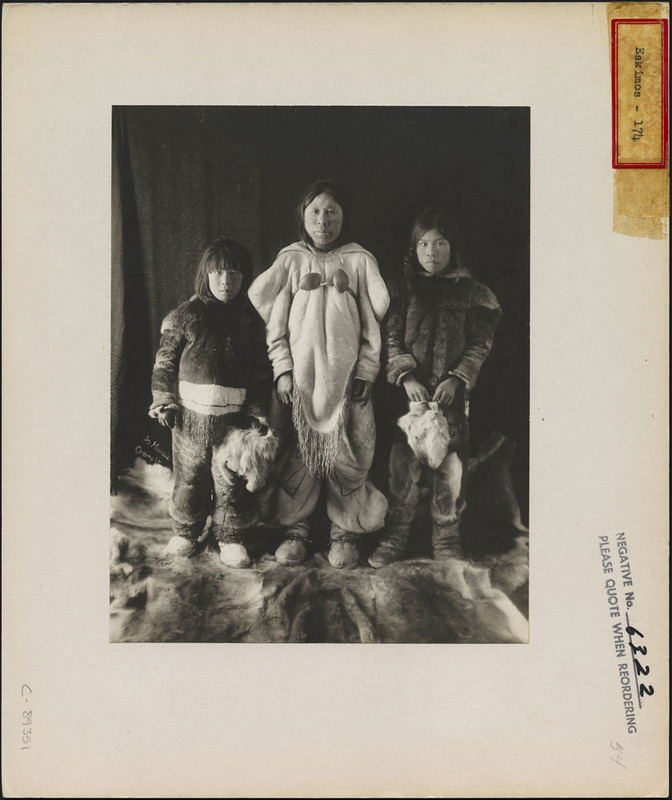 Library and Archives Canada (LAC) has roughly 30 million photographs from various collections in its possession, a large number of which have Aboriginal content. During my time here as part of the Federal Student Work Experience Program (FSWEP) working on Project Naming, I have been able to explore the database and discover breath-taking photographs from different Aboriginal communities all over Canada. Although the photographs themselves are quite wonderful to behold, the records often leave something to be desired. For many Aboriginal images, the titles contain antiquated and offensive language, or are simply vague. It is imperative that these records be updated with modern terminology and information gathered from members of the communities where these photographic records originated. The involvement of Aboriginal people in this process is crucial because these records depict their history, their culture, and their families; their voices are the ones that have been omitted and lost. As I myself belong to the First Nations, I have greatly enjoyed being able to share my culture and help restore the lost voices of photographs by helping to update the records. Since Project Naming began in 2002, more than 2,000 photographs have been identified. Additionally, thousands of records have had inaccurate and insensitive terminology removed from their titles and moved into a general notes field in order to provide historical context and perspective. Identifying names, places, events, and cultural objects facilitates the sharing of Aboriginal culture and stories with all who are interested in searching the archives. 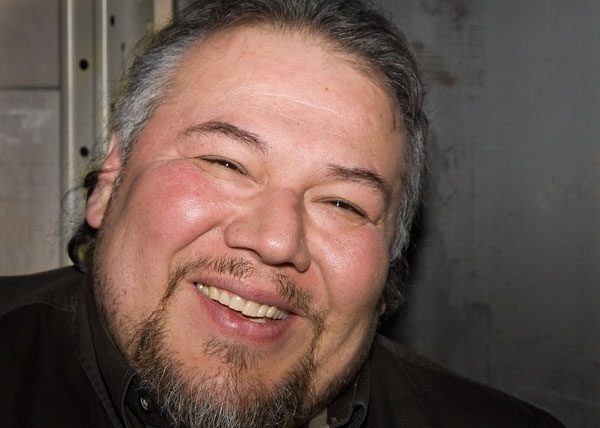 These include stories about Aboriginal politicians, for example Inuit Senator Charlie Watt who represents Quebec. I had the pleasure of working on DIAND Album 38, which contains several photographs of young Charlie Watt and his parents, Daisy and Johnny Watt. 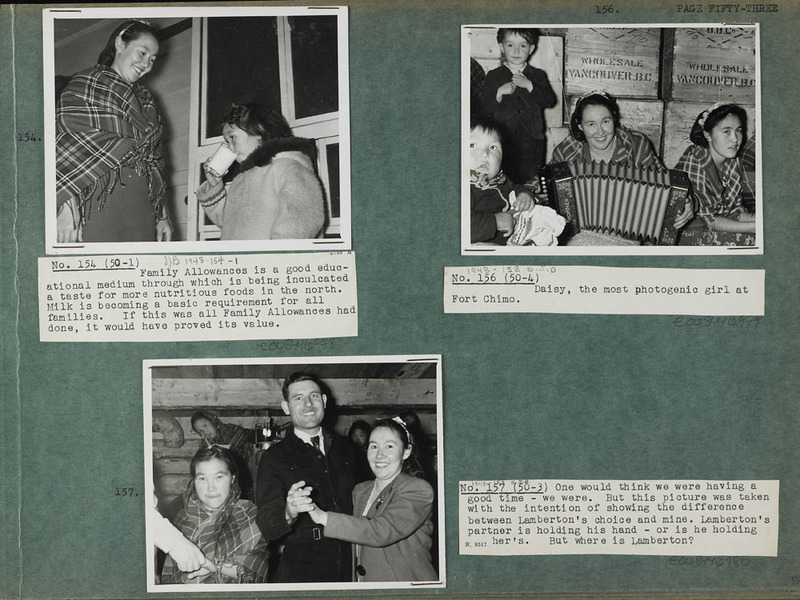 The photographs take place at a party in Kuujjuaq (formerly Fort Chimo), Quebec, and even though the photographs are black and white, the vibrancy of that Inuit community shines through. 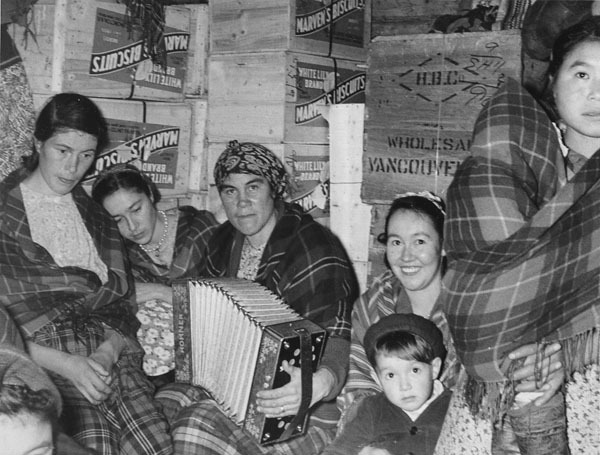 All of these photographs are essential to the telling of Canadian history. 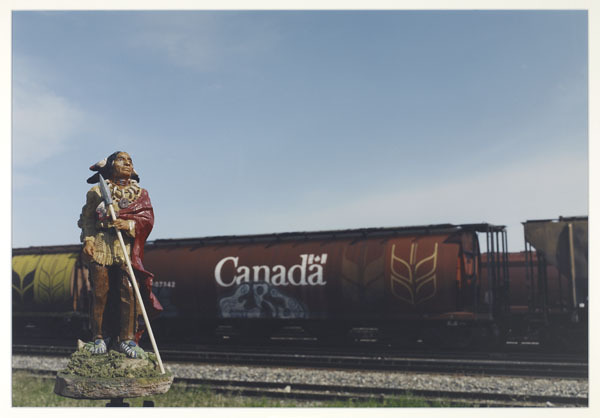 They demonstrate the narrative of the relationship between Aboriginal people and the Canadian government, and most significantly, they tell the stories of the individuals in the photographs and share their culture. 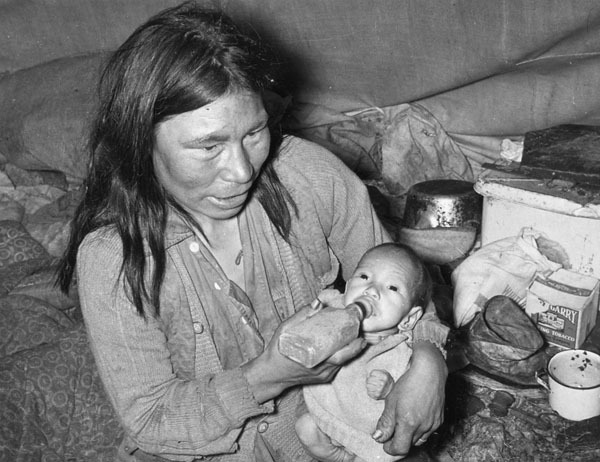 For decades, First Nations, the Metis Nation, and Inuit voices have been lost in these records. Project Naming is vital because it provides Aboriginal people a forum through which they can reclaim their stories and identities. I am glad that I have been able to contribute my voice, as a First Nations woman, to these records. There are so many stories to be told, and I am sure that as LAC continues to move forward in partnership with Aboriginal peoples, we will be able to hear them. Harriett Mathews was an FSWEP student who worked in the Exhibition and Online Content Division at Library and Archives Canada during the summer of 2016. 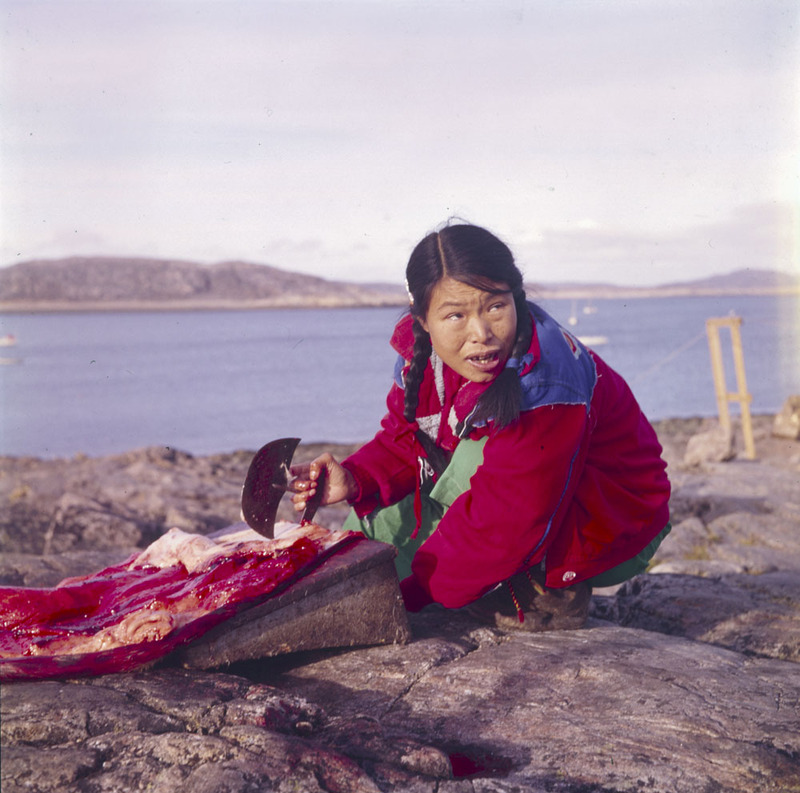 As part of Project Naming, a community engagement and photo identification project that aims to reconnect Inuit and their past, Library and Archives Canada (LAC) has undertaken the digitization of a series of photographs from the Indian and Northern Affairs Collection. 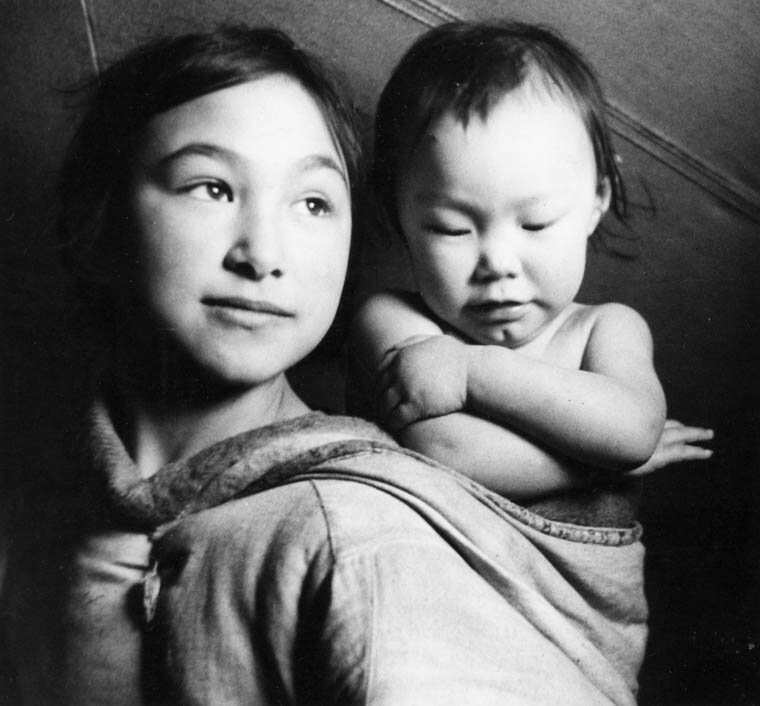 These albums have been the starting point of a great story regarding a family from Nunavut. 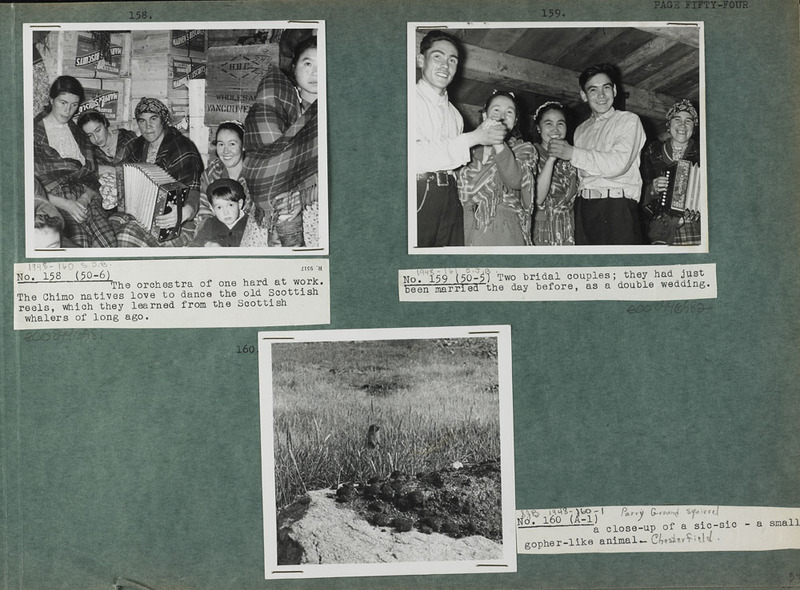 In this collection, are a number of images of the Weetaltuk family taken during the summer of 1949 on the Cape Hope Islands in Nunavut. The original captions accompanying the photographs provided basic details. Fortunately, the database records for these images are now more complete after several family members contacted LAC to provide the names of relatives and other relevant information about these pictures. Most importantly, they were able to correct the Weetaltuk surname, as well as community names that had been incorrectly recorded. 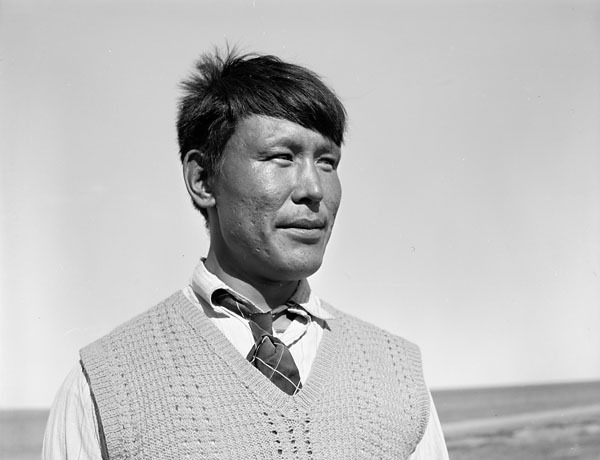 From the original captions, we knew that George Weetaltuk was a community leader, a skilled hunter and an expert boat builder. His family members explained the detailed process that George followed in creating his boats, as seen in this photograph of him with his son, William, and his adopted son, Simon Aodla, constructing an 11.58 metre (38-foot) boat. 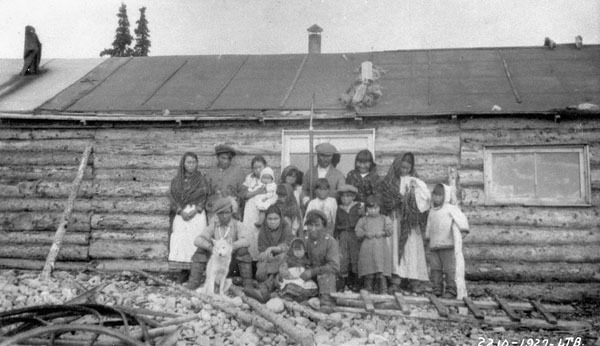 Another record that the Weetaltuk family was able to correct was this group photograph taken in front of a log cabin. The caption states that this picture was taken on Cape Hope Islands. We now know that the picture was probably taken on nearby Charlton Island, James Bay, where for many years, George and his family resided while he was employed seasonally by the Hudson’s Bay Company. In addition to this information, the family was also able to identify five of the people in the photograph, and provide genealogical connections. 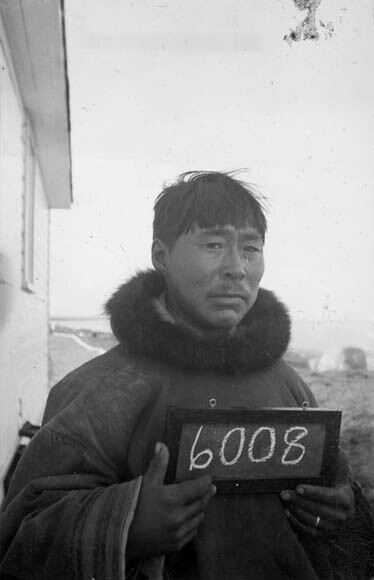 Although Eddy started writing E9-422: Un Inuit, de la toundra à la guerre de Corée in 1974 (in French only), it was not published until 2009 only a few days before his death. 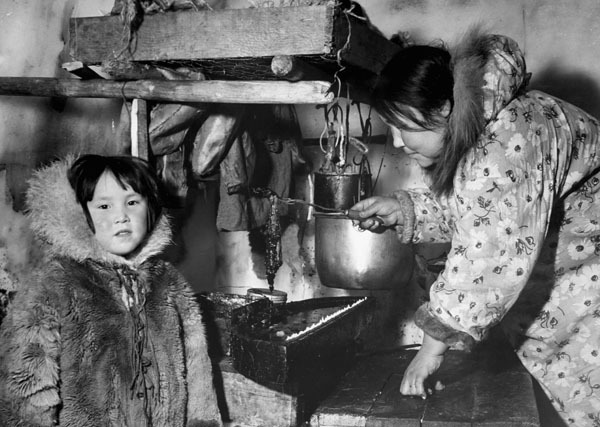 Through these family connections and dialogue with the community, our photographic collections are constantly improved and enriched for future generations. For more information about Project Naming, read our Blog article, published on May 9, 2013, and listen to our Project Naming and Canada’s North podcast. 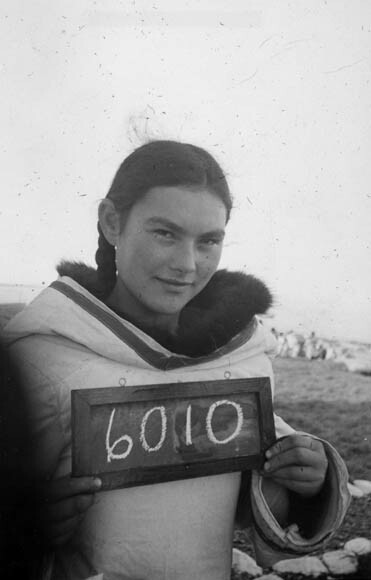 Initiated in 2002, Project Naming is a community engagement and photo identification project that aims to reconnect Inuit with their past by identifying the people and events portrayed in photographs held at Library and Archives Canada (LAC). We have added the names of individuals and descriptions of activities to our database, which you can search online. Over the last ten years, we have digitized more than 8,000 of those photographs and have received identifications for approximately 1,900 individuals. New information about these pictures is gathered through a variety of methods, including an online form, community slide shows and other social gatherings, weekly features in local newspapers, social media and on-site research visits. Quite often, identifications come as a result of intergenerational conversations that take place in person or virtually—or both. Such was the case when Nunavut News/North published a photograph of Rhoda Qaqsauq, and her daughters, Lucy Evo and Janet Tagoona, on February 11, 2013; upon discovering this picture, Deborah Kigjugalik Webster shared it on Facebook, thus sparking a lively conversation between her and other family members. 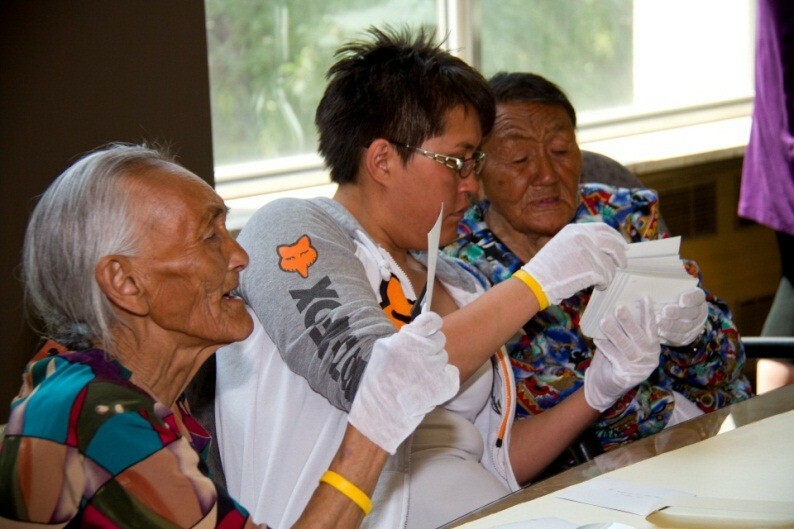 An example of a successful on-site visit occurred in June 2012 when a group of Elders and youth from Arviat, Nunavut, located on the southwest coast of Hudson Bay, made a trip to Ottawa. They looked through hundreds of photographs and negatives taken between the 1920s and the 1970s. This enabled them to identify 31 family members in 17 images. 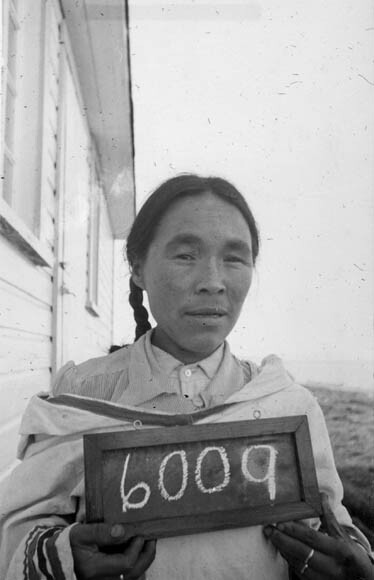 Louisa Gibbons discovered her mother, Catherine Kopak, and her grandmother, Yarat, in a picture taken in Kingayualik, near Padlei. 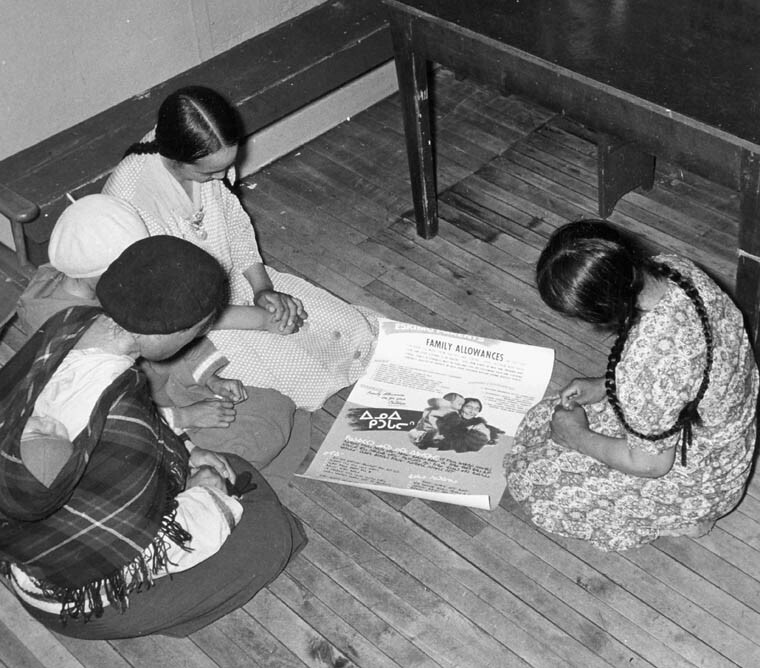 Elder Eva Muyunaganiak (left), Louisa Gibbons (centre) and Elder Mary Nowtalik (right). 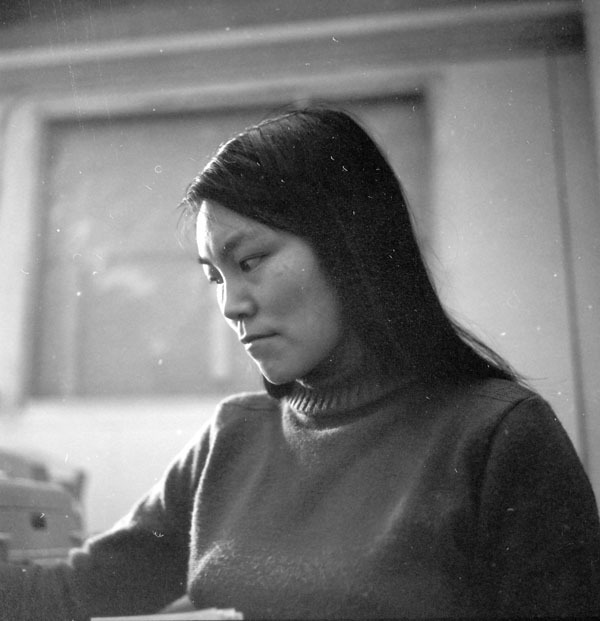 Elder Eva Muyunaganiak also discovered a photograph of her mother, Uyaupiak, dating from the late 1960s. Today, the remaining 22 Elders in the community of Arviat are the only ones able to recognize people and describe what life was like in photographs taken more than 50 years ago. Elder Muyunaganiak passed away in September 2012; her death reminds us of how time-sensitive an initiative Project Naming is. Project Naming has now evolved into a broader community engagement initiative that has expanded beyond the territory of Nunavut to other Aboriginal communities in the Yukon, the Northwest Territories, Nunavik (northern Quebec) and Labrador. We hope to build upon this dialogue with members of Northern communities using new technologies and social media. To learn more, listen to our Project Naming and Canada’s North podcast.